Are there options available for QuickBooks hosting or QuickBooks remote access? This is a common question we get at Cameyo. The answer is yes, but how it is hosted depends on the version of QuickBooks you need. According to QuickBooks’ website, almost 6 million customers are using its powerful accounting software. 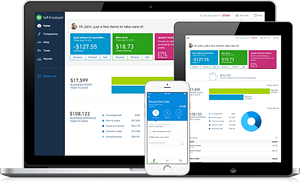 Geared towards small and medium-sized businesses, QuickBooks offers software that you install on your Windows or Mac computer or an online service that is completely hosted. When choosing, you should be aware that there are significant differences between the desktop versions and the online service. What if I want to access QuickBooks Pro, QuickBooks Premier or QuickBooks Enterprise from Another Device? 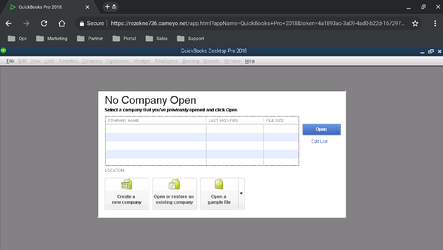 As you are likely well aware, the QuickBooks desktop version is installed locally on a Windows or Mac computer. Unless you set up QuickBooks remote access, which can be complicated and does not always work well, you can only access the program from that particular computer. A simpler option is QuickBooks Cloud Hosting, which is offered for an additional fee. With QuickBooks hosting, you can access the QuickBooks desktop programs from the browser on any device. The only thing you really need is a good connection to the Internet. The service is run in a secure environment, but as with anything security related, you should use a strong password and make sure your computers are running the latest OS, antivirus and browser versions. Can I run QuickBooks on a Mac? Yes, but if you are a Mac user or organization, the best way to utilize QuickBooks is the online version. However, if you need the additional features only available in the desktop programs, Intuit offers QuickBooks Desktop for Macs. The program is not identical to the Windows version. Be sure to check to ensure that it has the features you need before purchasing. How do I access QuickBooks remotely? Cameyo for QuickBooks is the perfect solution for customers who need the power of QuickBooks Pro, Premier or Enterprise, but don’t want to pay expensive hosting fees. QuickBooks remote access costs starting at just $100 per month for access on five devices, Cameyo for QuickBooks is the most cost-effective way to deliver QuickBooks to any device, no matter where you are. And it works the same way it does on the desktop. Customers just like you are using Cameyo for QuickBooks. QuickBooks for electrical contractors proves to conveniently run QuickBooks from the cloud. JTM Electronics selected Cameyo to access QuickBooks Enterprise from any device while reducing costs and increasing productivity. Click here to view the JTM case study. Built for the Cloud - Cameyo's application Platform as a Service (aPaaS) is the only solution that is built for the Cloud and runs in any customer environment - public, private and hybrid cloud or on-premises. Simple - No infrastructure required. Set up takes minutes. Can be done by anyone with little to no IT experience necessary. the most secure Cloud platforms available (Forrester recently named Google Cloud a leader in its Public Cloud Platform Security Wave). G Suite Integration - Seamless integration with Google Admin to deliver, single sign on multi-factor authentication, application, printer, Google Drive folder permissions and printing through Google Cloud Print. Bottom line: Quickbooks is simply the best accounting software or service for small and medium-sized businesses. If you can’t use QBOnline, Cameyo for QuickBooks is the most cost-effective and secure way to deliver QuickBooks’ desktop application to any device, including ChromeBooks. Click here to get started now.